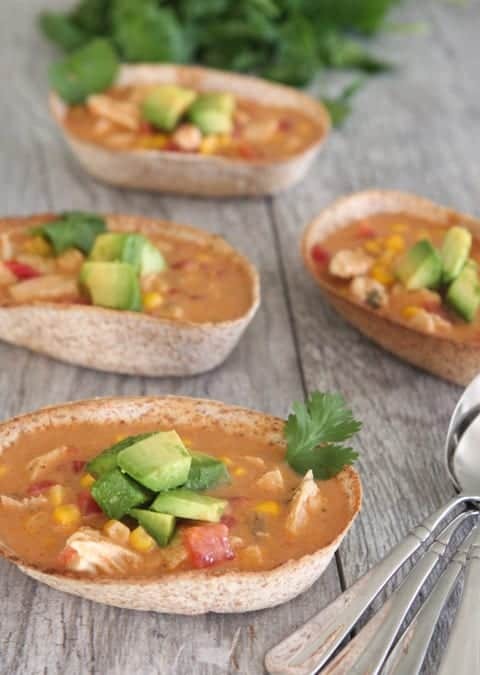 These Chicken Enchilada Soup Boats make the perfect weeknight dinner for the whole family! Just a few ingredients is all you’ll need to get dinner on the table this week. Enjoy! 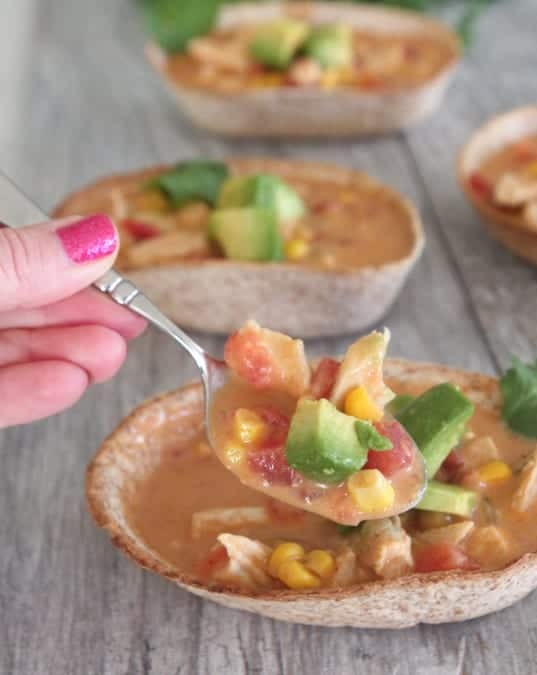 My Chicken Enchilada Soup Boats are great for the whole family! It’s always a pleasure partnering with Old El Paso to bring you quick and simple family friendly dinner ideas! I’ve put together a weeknight dinner that couldn’t be more simple to prepare plus it’s packed with great Mexican flavors. I know how busy the school week can be with all of the kids different activities and homework. It’s so nice to have quick to prepare dinner recipes for a stress free experience. 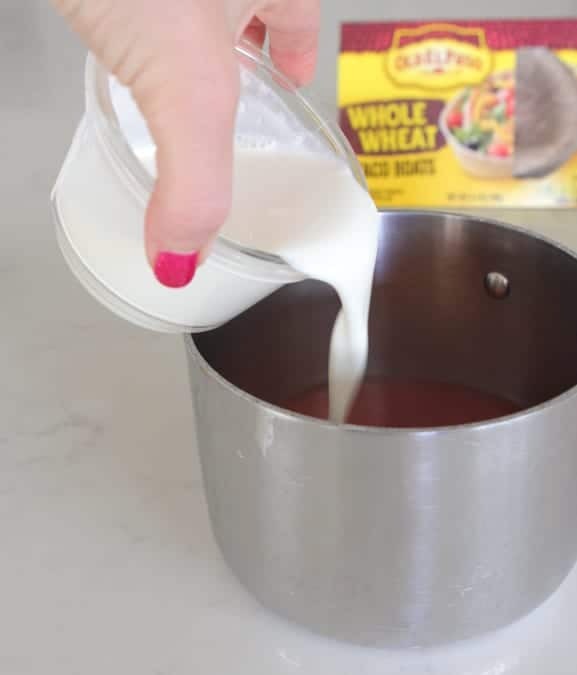 I used Old El Paso’s Whole Wheat Taco Boats as a “bowl” for my simple soup. The kids loved this! I placed the taco boats onto a baking sheet and bake until slightly browned and crispy. Only takes about 10 minutes and they come out nice and crisp to hold your soup. 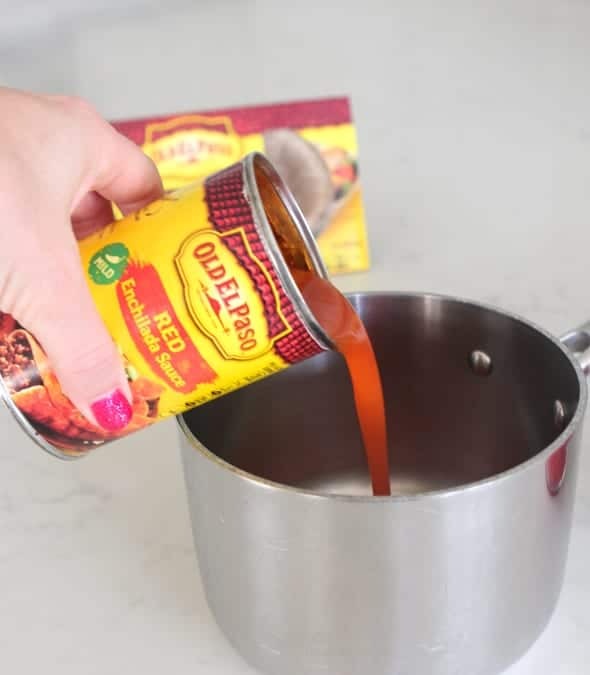 To make the soup, pour the enchilada sauce into a small saucepan. 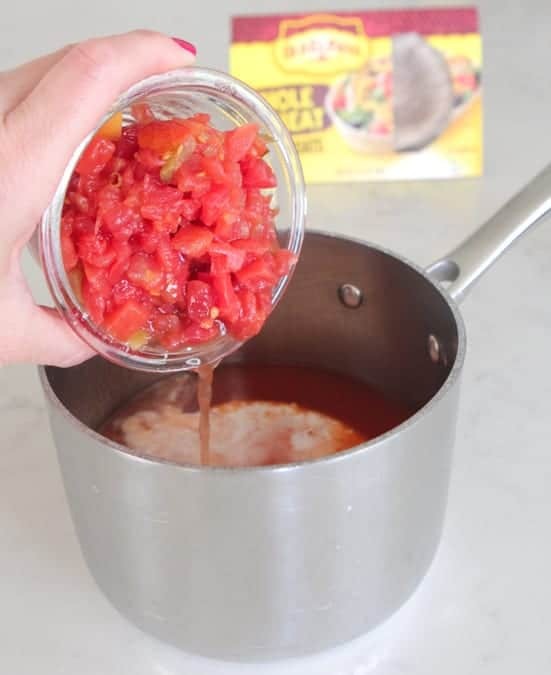 1 can of diced tomatoes with green chilies. Some sweet corn kernels, a little garlic salt and cumin. 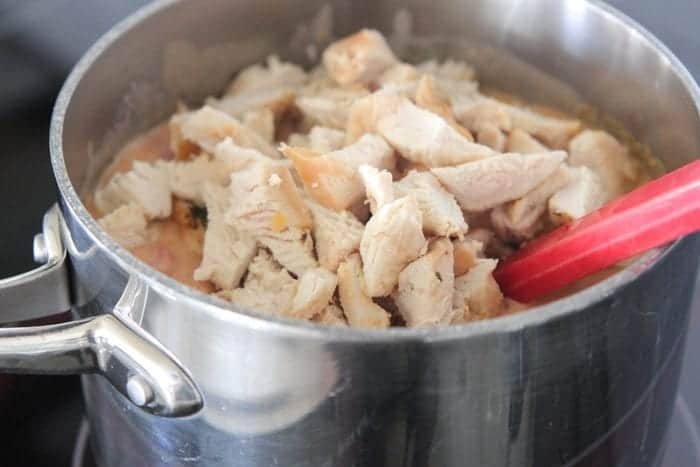 Stir in the cooked chicken and let simmer for about 15 minutes. Carefully spoon your soup into the taco boats and garnish with fresh cilantro leaves and cubed avocado if you’d like. Enjoy! Preheat oven to 400 degrees F. and line a baking sheet with parchment paper. 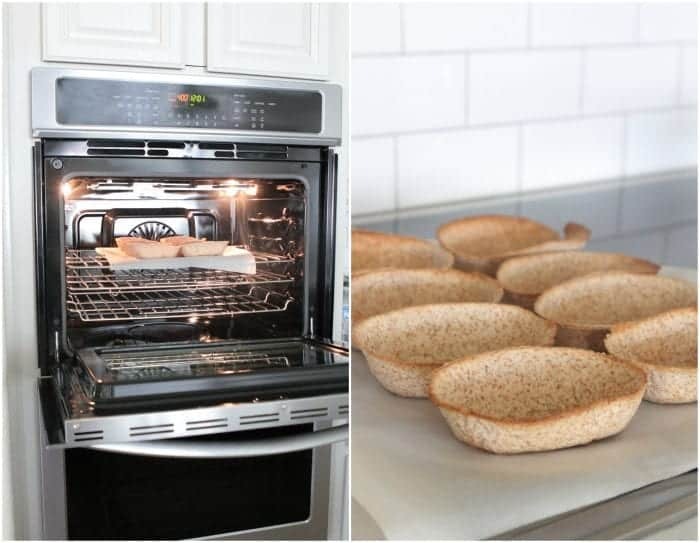 Place taco boats onto baking sheet and bake for 10 minutes, until golden and crisp. Remove and set aside. 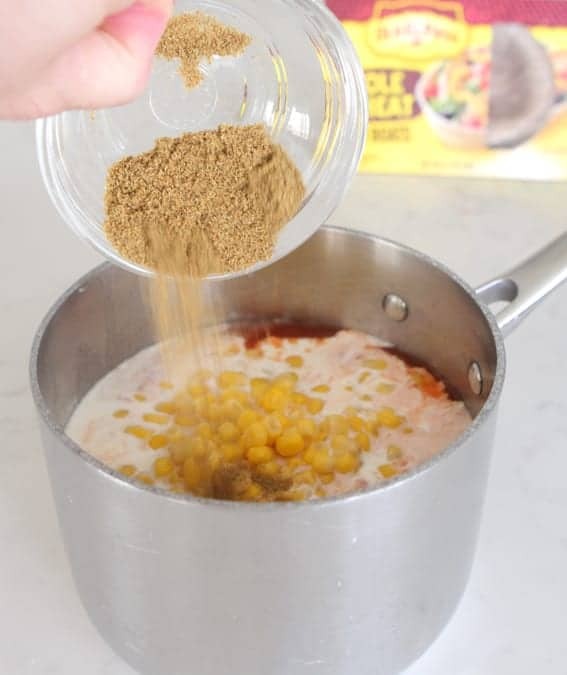 Place enchilada sauce, cream, tomatoes, corn, cumin, salt and chicken into a small saucepan over medium heat. Stir until hot then reduce to a simmer until ready to serve. 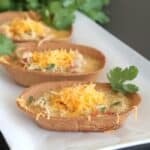 Before serving, spoon soup into taco boats and top with cilantro and avocado if desired. Love LOVE how simple this is! 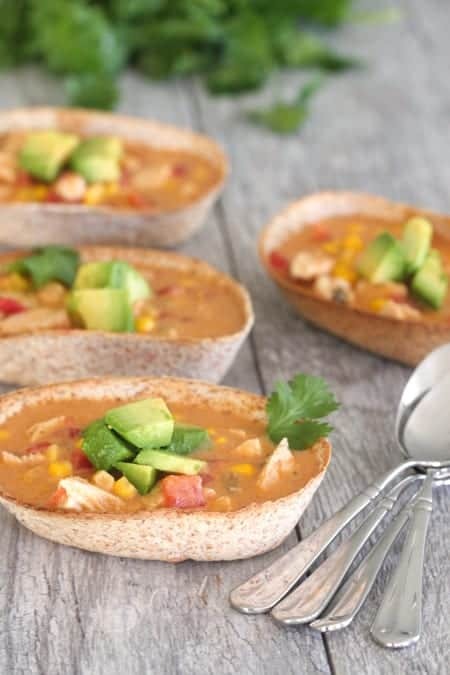 Using those tortilla boats as little soup bowls is genius! 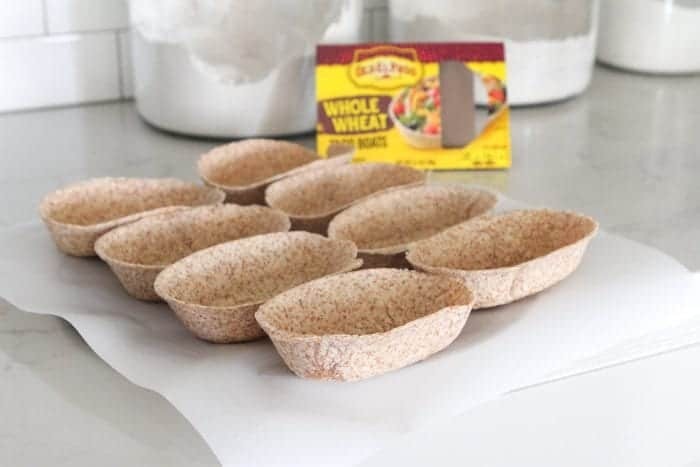 Jenny, I did not even know there was such a thing as whole wheat taco boats. What a great way to use them! Thanks for sharing this great weeknight meal. I’m going to look for those wheat shells this week! I bet they would work great with some kind of spicy breakfast egg dish too! Jenny- that is so clever! 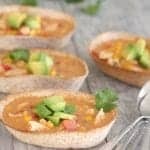 Love the idea of tortilla soup bowls! How fun! What a fun idea! My kiddos would love this! My boys would have so much fun eating these! These are super cute and look soooo tasty! What a great idea!I can’t wait to try this out! Whats not to love about an edible bowl! I love the simplicity of this! Perfect for those busy days when I just don’t have a lot of time to make dinner!